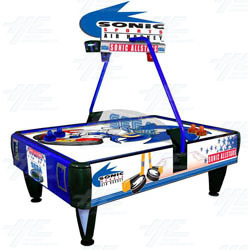 Sonic Sports Air Hockey is an air hockey table from Sega featuring the company's iconic mascot, Sonic the Hedgehog. This air hockey table is suitable for 2-4 players with a wider playing surface to accommodate 4 players. The unit has a built in ticket dispenser for redemption with an adjustable ticket payout. The machine has under table lighting effects, neon over head lights to display the score, and chasing LED lights. Features a polycarbonate non-scratch play field, aluminium body and side safe guards to make it a very sturdy and durable machine. This air hockey table is suitable for 2-4 players with a wider playing surface to accommodate 4 players. The unit has a built in ticket dispenser for redemption with an adjustable ticket payout. The machine has under table lighting effects, neon over head lights to display the score, and chasing LED lights. Features a polycarbonate non-scratch play field, aluminium body and side safe guards to make it a very sturdy and durable machine.